The services of the S.O.S. Raptor Hospital are constantly in demand and although its busiest season (with baby casualties & orhans) is late spring, cases continue to stream in through every season of the year. In the middle of July, a call for help was received from the owner of a Suffolk farm which had suffered tree damage over the course of one particularly windy night. One of the large trees which fell in the storm contained an owl nest box - home to a young barn owl family. Two young barn owlets were still within the box when it fell and appeared to have been abandoned by the frightened adults. The youngsters were transported to the Raptor Hospital at the owl sanctuary and, after close examination, were found to be suffering from cold, wet and, understandably, shock! After a couple of days of warmth, rest and nourishment, the youngsters were transferred to a hack box in a peaceful location on the edge of a meadow on a local farm. Here they would be able to build their strength and confidence in preparation for striking out into the habitat independently. A week later, the S.O.S. Raptor Hospital received a call for assistance from a Norfolk farmer. A river ran through his arable farm and one morning he noticed a young barn owl perched on the bridge spanning the waterway. As he passed by the same spot each day, the farmer kept a weather eye on the owlet to ascertain whether it was fit and well and part of a family group. Them Norfolk folk always have to show off! One of the youngsters stretching it's wings in the hack box. The young owl remained on the bridge, seemingly alone and by the fourth day of observation, the farmer concluded that it probably needed help. He managed to catch up the bird without a fuss - a sure sign that things were not as they should be - and brought it into the Raptor Hospital for assessment. The owlet appeared to be uninjured, but weak and hungry, so plenty of rest, quiet, food and TLC was prescribed. After 3 days of close observation in the hospital, this youngster was also deemed well enough to be prepared for release. 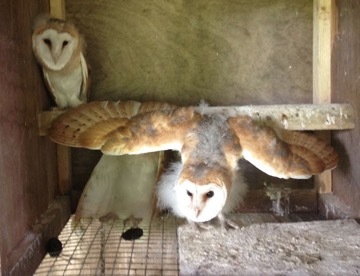 The two Suffolk barn owls were still enjoying the protection of their hack box and it was thought that they may appreciate some company, so the Norfolk owl was introduced to them and invited to share their accommodation. Luckily, local derby behaviour did not ensue and the owls all settled down comfortably together until their final release in mid August.